The release date is finally here, so while your physical copy is on the way – why wait any longer? 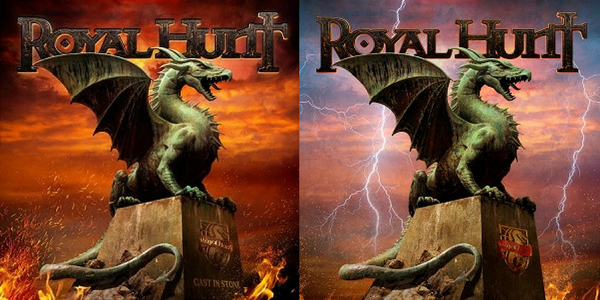 Log in to get your free download of the album right now in the store – royalhunt.com/store (You should be able to see the downloads after logging in). While “Cast in Stone” keeps getting fantastic reviews across the board we´ve been made aware of the fact that its darker, deeper sound we chose to use this time might not come across clearly enough while played on some less advanced sound systems (and maybe not all of us love that warm, analog-tape-based sound), we decided to include a lighter/slimmer mastered version of the album as an extra bonus for all who order from us directly. Thank you so much for this opportunity to download the album in 2 versions! As for me I prefer the original darker version. So after two weeks of listening it I can say that it’s a true hard rock album and I like it! It is really great! Thank you guys. So, The Album is not bad. Good songwriting and i love The backing vocals from Kenny Lübcke. I like the Refrain from the Fistful Of Misery song, or the Instrumental Track Cast in Stone is really awesome! Unfortunately, Cast in Stone reached never masterpiece albums like Moving Target or Fear! For me have Cast In Stone to much unnecessary guitarsolo’s and i don’t understand why André Andersen give Jonas so much space!?! Cast In Stone have for me, as a die Hard Fan from Royal Hunt too little Keyboardsolo’s (the Same problem like the last albums!). Now, i really wish a solo album from André Andersen without guitars and with a lot of piano and Keyboards. I wish the band good luck for the future.